A facile and efficient method for the preparation of 3-imidazolylpropionic acid N-oxides has been developed. It involves condensation of 2-unsubstituted imidazole N-oxide with an aldehyde and Meldrum's acid followed by hydrolysis and decarboxylation of the corresponding adduct. This method tolerates a broad variation in the structure of starting aldehydes as well as N-oxides. The online version of this article ( https://doi.org/10.1007/s10593-019-02431-7) contains supplementary material, which is available to authorized users. This work was supported by Russian Foundation of Basic Research (grant 18-33-00162 mol_a). 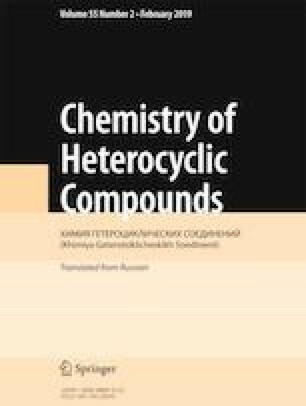 Supplementary information file containing 1H and 13C NMR spectra and HRMS of all synthesized compounds is available at the journal website at http://link.springer.com/journal/10593.